Chekhov is engaging with an underlying, rumbling, non-event that pervades life and yet is nearly always blithely ignored. His stories move us in their ability to excavate this subterranean, haunting static that informs all experience. 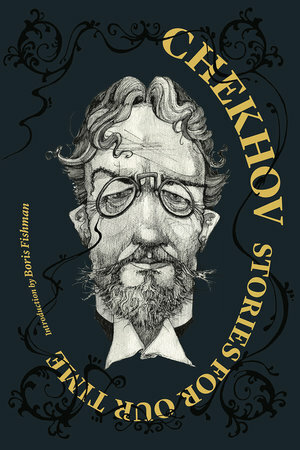 In his introduction to a new collection of translations (mostly the revered English translations of Constance Garnett) of selected Chekhov short stories, Chekhov: Stories for our Time (Brooklyn, Restless Classics, 2018), Boris Fishman insists that Chekhov engages in a bid for realism, that his approach is "as radical as it is simple: tell things how they are, not how they should be" (xiii). One fears that Fishman hereby establishes a rather false dichotomy between the irrealism of stories that depict transformations and the realism of those that do not. The magic of the Chekhov tale cannot be reduced to its proximity to life in its quotidian vestments. Besides, life is full of transformations, so their inclusion cannot be a criterion for the distinction between the real and the unreal. Chekhov's contribution lies elsewhere. Many commentators discern that contribution to be structural. It is something of a critical commonplace to discuss the short stories of Anton Chekhov by examining their endings—or what many take to be their "non-endings". While most stories prior to Chekhov reach some kind of climax or epiphany, Chekhov's stories end with a whimper or a "return to zero", meaning that the characters are in the same position at the end of the story as they were at the opening—no lessons learned, no life-altering experiences gained, no alteration of existential conditions. Some stories even seem to intentionally stop prior to reaching a projected sense of closure. Virginia Woolf described this non-ending as seeming "as if a tune had stopped short without the expected chords to close it." I would like to suggest, however, that while this is an adequate description of Chekhov's approach to endings, there is something more philosophically astute happening in these stories, and that the "return to zero" is a symptom of his underlying concern rather than being the primary concern in its own right. It is not simply that these particular characters fail to achieve the epiphany that characters set forth by other authors experience so regularly. Rather, Chekhov seems to be exposing something about our relationship to the unfolding of life and experience as such, something that gets overridden or ignored by our concern (in history and in literature) with the "event" (whether that is a world-historical event or a personal event). Chekhov, I contend, is engaging with something deeper than the event, an underlying, rumbling, non-event that pervades life and yet is nearly always blithely ignored. Chekhov's stories move us in their ability to excavate this subterranean, haunting static that informs all experience. We tend to measure our lives—public and private—through an assemblage of events. The event is a turning-point, a landmark. The event appears to be transformative, at least on some level. It may or may not be the moment when "everything irrevocably changes" but, at the very least, it is the moment when some things change. We quantify our lives and experiences through such events: marriages and divorces, birthdays and deaths, graduations, presidential elections, national calamities, international crises. These are the events that populate timelines, that provide us with the sense of an era (the Civil War era, the Vietnam era, the Reagan era, etc. ), that articulate through accumulation the quality of our lives. But, of course, they miss something of the actual quality of that life. We live through events and to some extent live in them, but not exclusively. The events are traumatic or the source of elation. They are the extreme moments but not every moment can be extreme. The event misses something vital about the quality of life. Then there is another, more profound, notion of event that one finds, for instance, in the thinking of Martin Heidegger. Those familiar with Heidegger's various writings on the event (das Ereignis) will remember that his approach to the event changes rather significantly over the course of his career and it becomes a major concern on his later work, starting with that enigmatic collection of writings known as Contributions to Philosophy (From the Event), written in 1936-38 but not published until after his death. I am interested here in his earliest documented thinking about the event, recorded in his "war emergency semester" (January through April 1919) lecture course, The Idea of Philosophy and the Problem of Worldview. In this course, Heidegger is concerned with the manner in which we appropriate and are appropriated to the world. We are worlded beings, meaning that there is not a clear line of demarcation that separates us as subject from a world external to us. I dwell in a world, am a "being-in-the-world" and whatever I am is inextricable from my worlded existence. When I encounter objects in the world, they are encountered as meaningful. I am not continually shocked by the world around me, it is familiar. I navigate it and make use of the things within it. Things have their place. They can be out of place but then can easily be set to rights. This is Heidegger's way of resisting the "theoretical" view (the notion that before we understand an object to be what it is, we take in sense perceptions and build a synthesis toward understanding) and insisting that our "pre-theoretical" view (that we simply see an object for what it is with all of its contextual meaning already apparent to us in that encounter) is more foundational. As an example, I enter my living room. 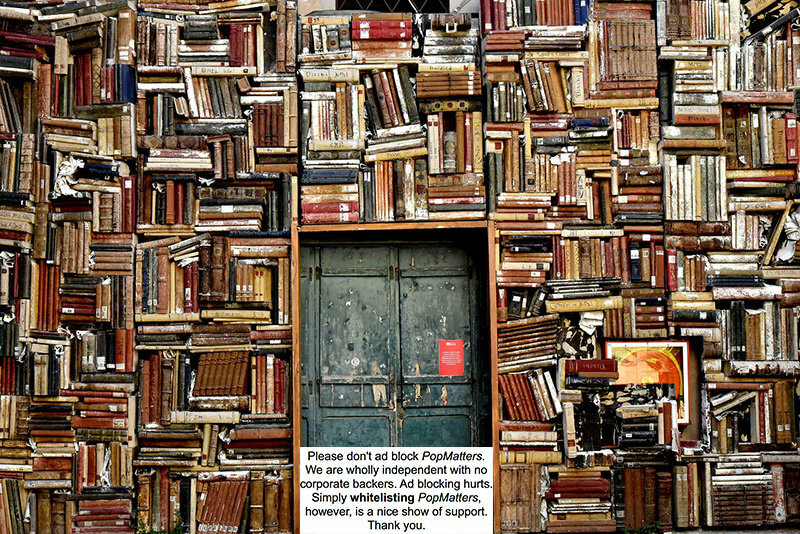 I see a television, several bookshelves full of books, a sofa, and a table. 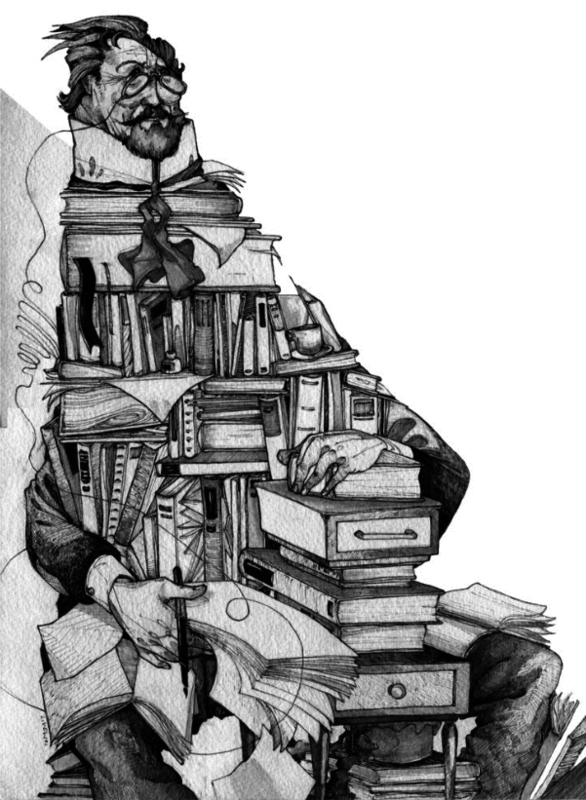 Other books are strewn upon the floor, on the table, on the sofa. My cat lies on the sofa along with my computer and a pair of headphones. A cup of water and a ream of paper towels can be found on the table. I don't enter the room and take account of each of these items; I don't constantly take inventory of the things in my environment. I appropriate these things to my activities. I don't run through some process whereby I internally account for the presence of the things. For instance, I don't look at my cat Coco and say: there is an object there; it is furry and curled up; it is alive and breathing; it is feline; it is black and thin; ergo it must be… None of this occurs to me; nor do I even think to myself "there's Coco". Rather her presence is simply part of the feel of that room, part of what makes it what it is: comfortable, informal, private. The books pertaining to Heidegger light up for me insofar as I consult them in writing this essay. The paper towels go unnoticed until Coco accidentally knocks over the cup of water and then I put them into service, without particularly thinking to myself "I am now putting paper towels into service." These things are meaningful to me because they are part of my world, which is always-already invested with meaning; they are, what Heidegger terms, my ownmost or my ownness. The notion of ownness is part of what accounts for my historical situatedness. I belong to my time and it belongs to me. I am not a mere symptom of the era in which I live, I carve out a space of own most meaning within that era that sets out a circumscribed area of meaning and belongingness. But at the same time, the era situates me; not all that makes me what I am is of my choosing. Some of the circumscription of meaning that I inhabit is set out by circumstance. But there are times when I have an experience that is so unfamiliar, indeed so defamiliarizing, that it disrupts my sense of ownness and worldedness. I find myself in a situation so unsettling that I have to reorient myself—or better, orient myself anew—to my now newly constituted world. These are what Gilles Deleuze would term a deterritorialization, a line of flight out of the structured world of familiarity into a radically new experience. At these moments, Heidegger suggests, I have an experience of the "There is" in itself. Whenever I experience something, there is an underlying logic to the experience that might be expressed as "There is X". But the experience of X is predicated upon there being a "there is". In Heidegger's German this is expressed as the es gibt, literally, the "it gives". Whatever that is, for Heidegger, is what gives the ground for experience. Usually we merely experience the given: my cat Coco is next to me on the couch. But in those rarified moments, I experience the givenness of the world: that there is a there there (to borrow from Gertrude Stein). In these moments, life seems to generate new experiences, new codes, new modes of understanding. What is given is the new. As abstruse as all of this may sound, it is actually a very common experience and we might go so far as to say it is upon these experiences that our typical notion of history relies. We don't often concern ourselves with the quotidian own most-ness of life. There are no histories of the many days I sit on this couch, watching that television, typing on this computer, listening to bluegrass with those headphones, and watching Coco sleep and knock over cups of water. Histories, even personal ones, tend to focus upon those events that reveal the new, that change (in however small a manner) the world and our experiences within that world. This is true also of the classic short story. Most short stories operate on the logic of the rarified event. They trace the arrival and consequences of some intrusion (internal or external) upon the lives of the protagonists. This intrusion need not be some world event, of course. O. Henry's "The Gift of the Magi" provides a fine example. An impoverished husband and his wife both want to please the other with a special Christmas gift and sell something precious to themselves in order to afford it. She sells her hair to buy him a chain for his cherished watch, he sells his watch to purchase her ornamental combs for her cherished hair. Not only do they thereby learn something vital about their love for one another, the narrator opens this small event onto Christological history (thus, at least through that religious lens, accessing a world-historical level) by comparing their demonstrations of love to the gifts of the magi for Christ. Whether they are stories of loss or achievement, most short stories (at least prior to Chekhov) depend on transformation; they involve the event as revelatory of the new. So, akin to the Heideggerian es gibt, the classic short story presents a world that constantly gives forth, a joyful expression of abundance and creation (even when that abundance involves tragedy). Emmanuel Levinas proposed an alternative to the Heideggerianes gibt that he termed the il y a (French for "there is" and thus similar to the German but without the literal translation of "it gives"). The il y afor Levinas is not the generous flowing forth of the Heideggerian es gibt. It is "the phenomenon of impersonal being" [Ethics and Infinity, translated by Richard A. Cohen (Pittsburgh: Duquesne University Press, 1985), 48)]. The il y ais the anonymous "it", the rumbling of minimal presence that lies behind all things. It is not nothingness but rather the something that persists beyond all things; the something where there are no things. It is the non-event that lurks behind the very possibility of events. Levinas sees the il y a as something mildly horrible. Levinas's first solution to the problem of the il y a was to say that we latch onto objects, determinate beings—along the lines of Heidegger's structure of care, wherein we tend to the world we inhabit—but this is a substitute for the il y a more than an escape from it; we are merely burdened by the encumbrances of our existence. The real route away from the il y a, for Levinas, involves becoming dis-inter-ested, disentangled from its troubling embrace. This is the act of taking responsibility for the Other, the true being-for-the-other that lies at the center of Levinas's ethics. It is this devotion to the Other—what Levinas hesitates to call "love" but that could certainly be seen as a heightened and particularly engaged and responsive form of love—that serves to "stop the anonymous and senseless rumbling of being" (52). I suggest that the peculiar charm and wistful evocation of the Chekhovian short story lies in its attempt to come to grips with the non-event; to come unflinchingly face to face with our experience of the il y a; to realize that as much as we might want to flee this anonymous something by latching onto determinate being or some beloved Other, these flights from the il y a are typically temporary, forestalling the nearly inevitable collapse back into the blank embrace of the non-event. In this sense, what is important about the Chekhov story is not the "return to zero" endings. They are an indication of Chekhov's concern but not the concern itself. One might "return to zero" (in the sense of returning to the point at which you began) without encountering or attempting to escape the il y a. The maneuver that Chekhov performs is far subtler and far more revealing. Instead of returning to the point of departure, Chekhov exposes the subterranean blankness that resides beneath the event, beneath our connection to the world, beneath our desire for the Other. This places many of Chekhov's protagonists in the Levinasian position of desiring escape from the dull horror of the impersonal something through flight toward a personal connection, however strained, however untenable. The classic example of a character yearning for connection only to be continually thrown back upon herself and the blank loneliness that undergirds social existence can be found in "The Darling", a tale that brought Tolstoy to tears. But to be brought to tears by the main character, Olenka, is to read the story as though it were a Tolstoy narrative of the quest for redemption through family obligation. But this is far from Chekhov's purpose. Chekhov attempts, on the one hand, to demonstrate that Olenka is a somewhat ridiculous figure and on the other hand to explore the underlying rumbling flatness that she attempts to escape, a flatness that is both the ground of experience (in the sense that all experience arises out of that il y a) and its negation (in that the il y a is the non-event, experienceable on in an oblique manner, those moments of minor dread when we are caught between being asleep and awake, when a subjectless something is happening or fails to happen). Olenka marries a theater manager and immediately adopts his mannerisms, his views on the banal desires of the majority of audiences, his concerns with the exalted art of the stage. She helps keep the theater's accounts in order and identifies herself fully with her husband Vanitchka's concerns, his prejudices, his views. The actors take to calling her "Vanitchka and I" because so many of her utterances begin that way. She attaches her identity so inextricably to his that she seems to have very little existence outside of him. When he dies, she descends into a deep melancholy but is soon comforted by Vassily Pustovalov, a manager for a timber merchant. She soon marries again and adopts his characteristics. Now she looks askance at the theater and such entertainments because her husband disdains them; she becomes thoroughly acquainted with the ins and outs of the timber trade, even dreaming of stock in a timber yard. He soon dies as well and she latches on to another man, an out-of-work veterinary surgeon who is separated from his wife. Her penchant for speaking in a knowing manner about the medical approach to domestic animals disturbs her new love. He leaves her. Now she was absolutely alone… She looked into her yard without interest, thought of nothing, wished for nothing, and afterward, when night came on she went to bed and dreamed of her empty yard. She ate and drank as if unwillingly. One might take this passage in numerous ways. It can be (and has been) read as a misogynistic view of woman's inability to think independently, on her subjugation (whether by nature or by social compact) to masculine volition. She is called "the darling" and is found so charming precisely because she makes no demand on anyone else, and appears to be a blank canvas awaiting the investment of whomever comes along. One finds her charming in the self-satisfied manner one finds one's own reflection charming. One admires her for how familiar she is because, after all, she merely echoes one's worldview. Only the surgeon becomes irritated and his justification of that irritation is that she pretends to knowledge she doesn't have (and thus compromises his masculine claim on expertise). It can also be read as a rather chilling account of the desolation of depression and loneliness. She no longer takes pleasure in the things that had amused her: the band concerts and fireworks, the distractions of social life. As she loses her attractive looks, people grow increasingly distant from her and she comes to believe that her best years have passed. The emptiness of her yard (her domestic space but a space that extrudes into the outside world and is thus at once personal and social) reflects her own isolation, that thrumming numbness that pervades the soul in a state of melancholy. One no longer wants to sustain a life through eating, nothing seems to matter. Her emptiness becomes "as harsh and as bitter as wormwood in the mouth" (15). While compelling, neither of these readings seem sufficient. There is something deeper that informs the passage. Indeed, it is the work of this passage to reveal that something in all its haunting anonymity, all its blank indifference. The rhythm of the story, its pacing, its ineluctable tracing of the oscillating pulse of attainment and loss, all make this moment seem to be not so much a culmination of the patterns of loss as a scraping away of surface distraction in order to assess the static constant that lies beneath our experiences. Notice that Chekhov describes Olenka's detachment first from her deceased or departed lovers and then from determinate objects (the exact reversal of Levinas's two stages for escaping the horror of the il y a). Without her lovers she has no purchase upon the world. Objects recede from her mental grasp; she recognizes their presence and yet they become a flat space of meaninglessness. They fall away from her at equal speed; that is, there is no hierarchy of importance in her relation to these objects or in relation to their recession. Indifference suffuses her outlook. Indeed, she has no outlook remaining to her. She requires attachment, not because she fervently loved these men (their interchangeability seems to speak against that) but rather because without them life loses the contours of discernment, signification, and ownness. This is the most chilling aspect of the passage and the story, in my opinion. Chekhov, siding in essence with Levinas over Heidegger, sees that the world and our experience of it can be stripped of ownness not just in extreme moments of the uncanny or chaotic disequilibrium but rather when equilibrium itself becomes paramount. That is to say, Chekhov indicates that the underlying basis of experience is not ownness. Rather ownness rests on a deeper buzzing sameness that is not our own but rather anonymous, without meaning, without sense. There were times when he envied the boldness and swagger of his companions and was inwardly wretched; the consciousness that he was timid, that he was round-shouldered and uninteresting, that he had a long waist and lynx-like whiskers, had deeply mortified him, but with years he had grown used to this feeling, and now, looking at his comrades dancing or loudly talking, he no longer envied them, but only felt touched and mournful (59). 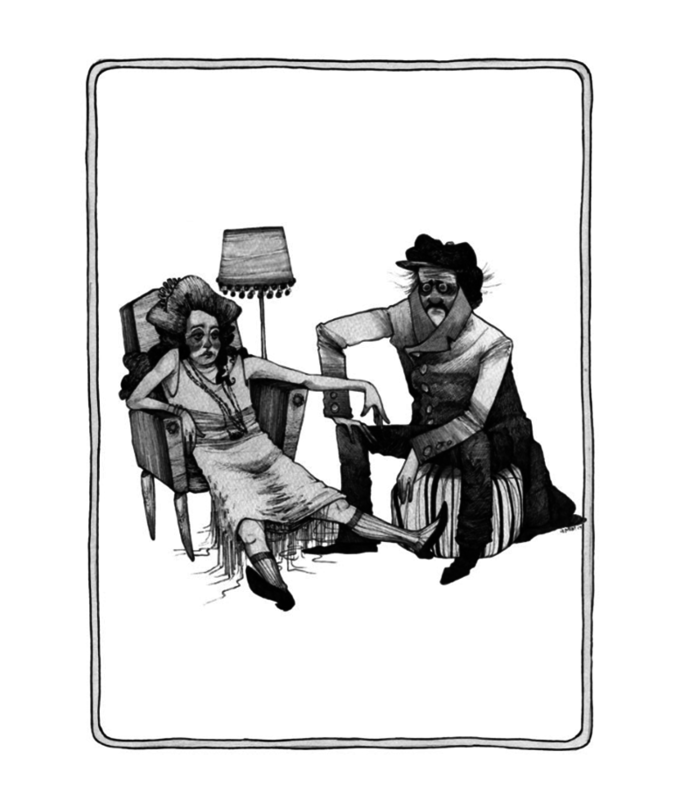 It is a stunning description that veers from self-pity to self-reassurance and a kind of accepting quiescence. Ryabovitch no longer harbored the expectation of the event; he didn't feel the need to see the world as an es gibt that generously threw forth experiences that lifted one out of the quotidian sameness of most of life. He accepted and even preferred the placidity of that sameness and the eagerness of his colleagues to transcend it saddens him in its pointlessness. And then, Ryabovitch wanders into a dark room and is unexpectedly kissed by a woman that he cannot identify but who quickly recognizes her mistake and flees the scene. [O]n his left cheek near his mustache where the unknown woman had kissed him there was a faint chilly tingling sensation as from peppermint drops, and the more he rubbed the place the more distinct was the chilly sensation; all over, from head to foot, he was full of a strange new feeling that grew stronger and stronger… He wanted to dance, to talk, to run into the garden, to laugh aloud… He quite forgot that he was round-shouldered and uninteresting, that he had lynx-like whiskers and an "undistinguished appearance" (61). Notice this passage's reversal of the earlier one. Whereas the previous passage went from shame of his appearance toward acquiescence to the blandness of his looks and life, this one moves toward an elation that transcends his concern with his appearance, an incitement to activity, a joyous eruption of vigorous gratitude. The passage nicely captures the irruption of the es gibt out of the monochromatic dreariness of the il y a. Now his military assignment became dreadfully dull to him, meaningless and drab. A hierarchy of value emerged within his life—even if it was predicated on an unknown benefactress. And yet, Ryabovitch realizes how very ordinary all of this new excitement is, how very humdrum. People kiss every day and nearly everyone will experience a romantic kiss (albeit in his case, misdelivered) multiple times in their lives. "It's all very ordinary," he says to himself, "and everyone goes through it" (70). What is touching here is that Ryabovitch feels himself lifted up to ordinariness. His flat life previous to the kiss, perfectly acceptable to him but perfectly bland, was sub-ordinary. The common lot of life is to occupy this hierarchy of joys and values, the vicissitudes of accidental occurrences and chance meetings. And yet "sub-ordinary" here means that which is foundational. While it is the common lot to occupy the ordinary with its events and its moments that stand out against the grain of unmarked indifference, at the same time everyone knows (whether they acknowledge it or not) that sub-ordinary substratum of anonymous sameness, the blandness of the non-event that underwrites the blandishments of the event. The water was running, he knew not where or why, just as it did in May. In May it had flowed into the great river, from the great river into the sea; then it had risen in vapor, turned into rain, and perhaps the very same water was running now before Ryabovitch's eyes again… What for? Why? Endless and pointless circulation of matter, the inexorable flux of life, constant surface fluctuation of an underlying zone of homogeneity, albeit a homogeneity shot through with heterogeneous intensities and unpredictable potentialities, the seemingly new being nothing more than further effusions of the same—Ryabovitch now returns to the zone of the il y a. Notice that in the typical sense of the phrase, "return to zero", this ending only partially qualifies. Ryabovitch has returned to zero in that he has left behind the temporary efflorescence of fantasy and hope he experienced in the aftermath of the kiss. He has returned to the absence of expectation, with its dull comforts, its undemanding and indifferent sameness. But he can hardly be said to be unchanged, he is disappointed now with his lot in life rather than complacent, and I wonder if those critics who adulate Chekhov for his "realist" attempt to demonstrate that nothing actually happens in most lives have not missed the mark. Something does happen in the Chekhov story. Indeed, what Chekhov exposes is the something that is always happening behind the scenes in our lives: that blank something, that crackling static, that numbingly vibratory pulse that is always there and that is the condition of there-ness. What Chekhov reveals is the il y a, the non-event. In Heidegger, the es gibt is a joyous burgeoning forth of the endless creative faculty of the there. To say "there is x" is to say that Being and the event give forth not only x but the field of life that serves as the condition of x, the "there-ness" of it all. In the Heideggerian imagination, this is an expression of creativity and generosity. Chekhov's vision (one he shares to some degree with Levinas) is darker. There remains a background presencing that is constitutive of the "there". There has to be. In order to say "There is x", we must have some sense of a "there" in which things (not just x) can arise. But Chekhov's vision is subtractive like Levinas's, not additive (or even relying on the logic of multiplication) like Heidegger's. We arrive at the il y a not by gratefully recognizing its generous production but by encountering the blank substrate that remains when all else is taken away. The es gibt is the logic of constant giving and the reception of the new; the il y a and the Chekhovian zero is the logic of loss and the recession toward the same. In short, the magic of the Chekhov story lies not in the "return to zero" (the return to where we start) but rather the "excavation of zero" (the recognition of the zero, the non-event, that is always already there, that informs our lives even while we are distracted by events). This all sounds very bleak but it need not be and I think that Chekhov reveals that there can be a kind of accepting comfort and wisdom that arises in the recognition of the zero. For as much as we might concentrate on the colorless sameness of the zero (as does Ryabovitch), we might also marvel at the strange emanations that arise from zero, the moments of meaning that emerge from the static, the fact that all color emerges from colorlessness (as colored light emerges from the hidden multiplicity of white light). Restless Classics has recently released a wonderful edition of 15 stories by Chekhov, including the three discussed here. 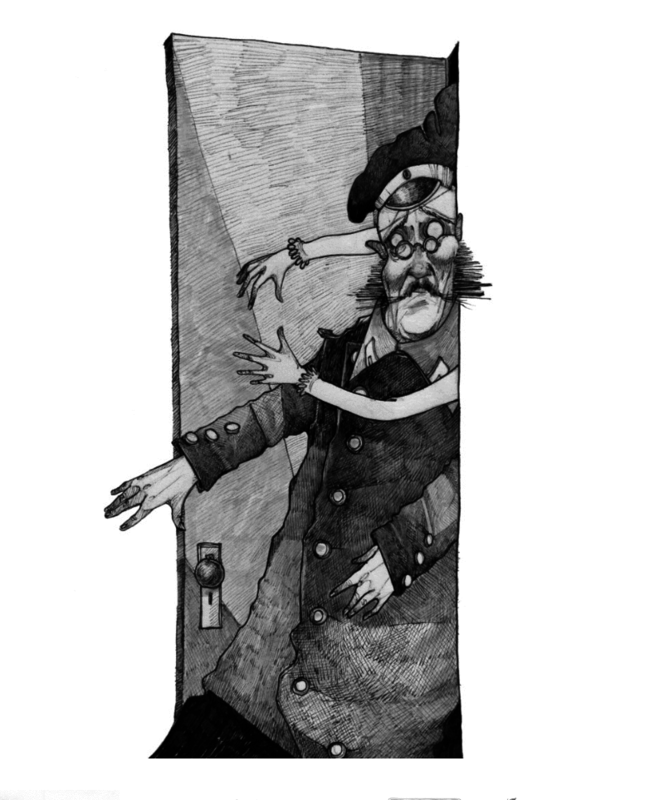 Matt McCann provides some fascinating illustrations and the edition includes an introduction by novelist Boris Fishman.